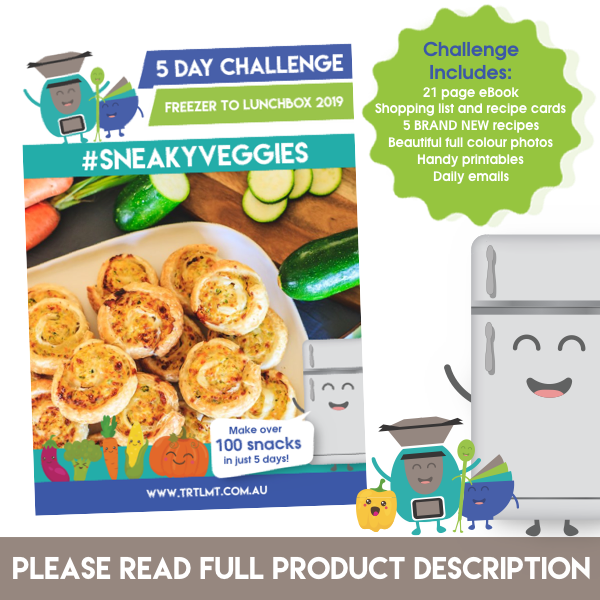 Please note: The 5 recipes featured in this challenge also appear in “Mixing with Kids: Sneaky Veggie” cookbook. Please read the full product description before purchasing. I love your enthusiasm but please don’t skip the below. This is an ebook. There is no physical item. When purchasing you will be asked to create an account. By creating an account, you will always have access to your e-purchases should any emails go missing in cyber space or you misplace them. More details further below. Welcome to another round of my Freezer to Lunchbox Challenge. Thank you so much for being interested enough to pop over and see what it is all about. 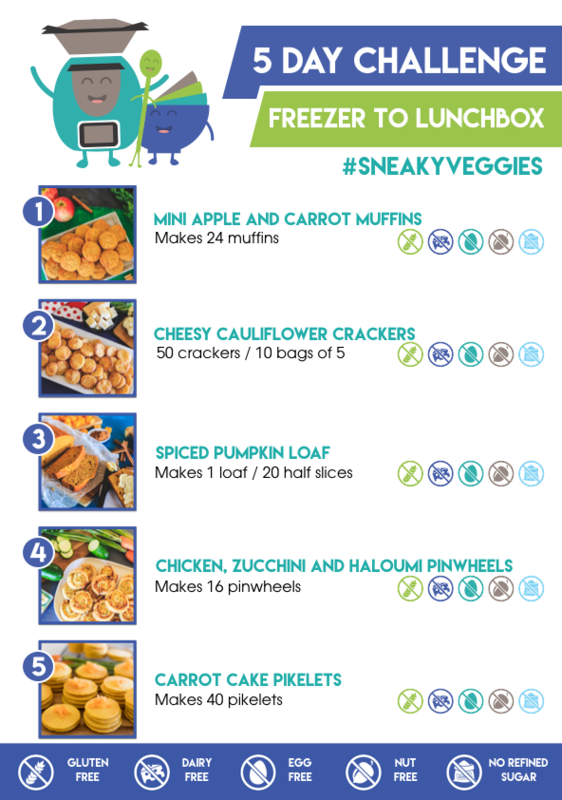 The challenge is designed to help families prepare for the upcoming school term by cooking one new lunchbox recipe each day for 5 days. This round we are cooking 5 sneaky veggie recipes. Yes, even the sweet recipes have some veggie goodness in them. We will commence cooking together on Monday 22nd April 2019. These recipes are budget friendly, kid approved and freezable. There is only 24 items on the shopping list – most you will already have in kitchen. Allergies have been taken into consideration when planning the menu. Both Thermomix and traditional instructions are provided for every recipe. I’ve covered everything… I hope! You will have lots of fun over the five days and at the end, a freezer full of snacks to make those hectic school mornings a little easier – 110 snacks in fact. School holidays are the perfect time for these challenges. Get the kiddies involved and make an event of it. What will be be cooking? Glad you asked! What do I get for my money? You better make it good lady! Once you have registered and purchased your challenge book it will be ready for you in your account on this website. You can access your eBook at any time. Click the link on the right hand site to download your copy. Download and have a squiz but hold tight! We will start cooking together from Monday 22nd April 2019. *** Edits to the ebook may be made if there is a typo or the like. See the download link (right hand column) in your account for the most up to date copy. The link will be updated as needed. Previous challenges were all email based. An email would be sent each day with the recipe and notes, additional recipe links and extra storage info if applicable. Whilst this round is being done a little differently the daily emails will continue throughout the challenge. Upon registering, your email address will be added to our mailing list. This is so I can email you with the above plus a dose of motivation throughout the week of the challenge as well as let you know about upcoming TRTLMT news including further challenges. You can of course unsubscribe from this list at any time quickly and easily. Please do not purchase if you do not want to be added to the mailing list. Please note: If you are purchasing this product on or after Monday 22nd April 2019 you will be emailed daily by evening. If you are purchasing this product after Friday 26th April 2019 you will not receive any emails. Woah! Hold up there. Why on earth are you suddenly charging for this you greedy lady? I know some will be a bit curious (or a tad miffed) as to why there is now a charge on these challenges when 2018 challenges were previously free. I ummmed and ahhhhed about this for months and spoke to many challenge lovers for their honest opinions. Please know this decision did not come easily. The main reason the challenges stopped in 2018 was due to cost. Each round costs between $600-800 (hosting, design costs, photography, newsletter system, website hosting, ingredients etc). By charging a minimal amount for the challenge I am able to continue these for those who love them. I have put so much blood, sweat and tears (yep, there were some tech issues which equals tears for this non tech savvy person) into this challenge. Hand on heart, I am so proud of this round. I have put everything into making sure this is top notch. My goal is for you to walk away and say “Holy guacamole. That is the best $3* I have ever spent!”. Note: $3 in the early bird price until Friday 19th April 2019. Price will be $5 after this date. Price is in Australian dollars and is inclusive of GST. Form of payment accepted: PayPal. When purchasing you will be asked to create an account. By creating an account, you will always have access to your e-purchases should you misplace then or change devices. Simply log in at the top of the page to access these after purchase. Recipes featured in the books may appear in future publications or the website. Recipes, prinatbles and images are protected by copyright laws. They are not to be reproduced, published or edited in any way without permission from TRTLMT. Copyright ©2019 TRTLMT. Upon registering, your email address will be added to our mailing list. This is so I can email you with any challenge updates, daily tips and motivation throughout the week of the challenge as well as let you know about upcoming TRTLMT news including further challenges. You can of course unsubscribe from this list at any time quickly and easily. I wish you the absolute best as you undertake my recipes, I truly do. My recipes have been created and tested by myself and I aim to bring you the best recipes that I possibly can. I do recommend, however, that you refer to the user manual for your appliance before deciding upon recipes to undertake and exercise caution and common sense in the kitchen at all times. In the instance that something lamentable occurs to your machine, your property, yourself or members of your household whilst undertaking my recipes, I will not accept responsibility for any damages. Every effort has been made to ensure each recipe in this book is accurate at the time of printing. However, I accept no responsibility for any inaccuracies that may arise. Before commencing any recipe in this cookbook, please be sure to read and adhere to both your thermo mixer user guide and safety manuals. Recommendations and guidelines can change, so be sure to stay up to date with your company of choice. Each appliance differs, therefore the recipes and methods are to be used as a guide only. Exercise caution and common sense in the kitchen at all times. Welcome to The Road To Loving My Thermomix or TRTLMT. 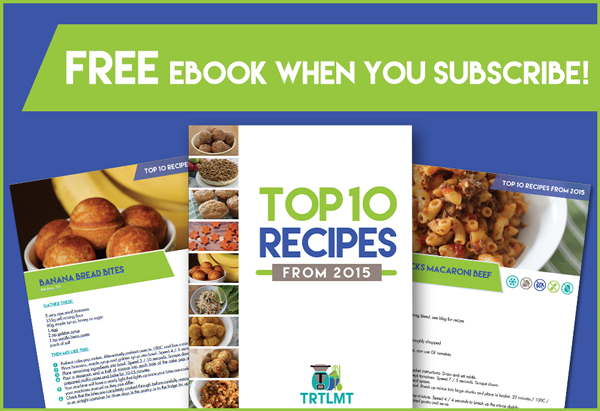 Here you will find recipes for the whole family that are budget friendly yet delicious. There is something here for everyone. Grab a coffee and sit back and browse our recipe list. Your new family favourite is waiting for you!